Yesterday we mixed together the animation with the original score and sound design and we now have a 7:40 minute film. Words seem to fail any description of gratitude or humility we are feeling right now, so here's a picture. We here at Bystander are proud to present the first ever footage from Bystander to the general public! Please enjoy the world premiere of the Bystander trailer! Are you on the edge of your seats? Do you want to see more? Of course you do! The full film will premiere at Northwestern University on June 2nd! We hope to see you there! We have news. And it's the best type of news: good news. What's that good news? In short, our first publicized quest failed. But that's okay, because we still got it done, just a few days late! Which means all shots have been inked. Congrats to us! In other news, we've exported 33 shots. For those of you new to the language of Bystander, that's almost 75% of our shots 100% made! Related to this, half the movie has been picture locked. More congrats to us! On the horizon...finishing all exports. On the sound side, composing and sound design have begun. Looks like we're going to have a movie! It's crunch time. With our June 2nd premiere deadline drawing ever closer we have quite an undertaking to get this animation done. On top of that, we would like to have a picture lock of animation done by the end of this month to give out composers and sound designer enough time to finish their jobs. As a result, we here at Bystander have undertaken a new form of goal process to motivate a fast and efficient completion of this project. We call them "Quests", as they represent a momentous undertaking to defeat. Where'd you Hide the 'Stache? 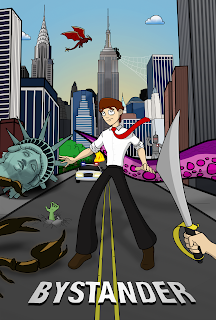 No, we're not making an action movie...but Bystander animating has re-started! But if it were an action movie, the good guys (that's the animators) would definitely be winning (against the evil paper?). A man moves from his boring, routine life to New York, but the city has unexpected plans for him...Bystander is a digital ink and paint animation, utilizing hand drawn images and the computer for coloring and compositing. It is the recipient of Studio 22's 2011 Special Projects Grant at Northwestern University. Co-directed and written by Ryan Naylor, co-directed by Neil Lokken, and produced by Robbie Stern. Bystander Animation. Simple theme. Powered by Blogger.